The Long Loneliness, Day’s classic religious autobiography, first published in 1952, and in print ever since. Available in Spanish: La Larga Soledad: Autobiografia, published in 1997 by Harper Collins. From Union Square to Rome, Day’s first account of her conversion, published in 1939, and reissued by Orbis Books. Available in Spanish: Mi Conversión: De Union Square a Roma. Madrid: Ediciones Rialp. The Eleventh Virgin, long out-of-print semi-autobiographical novel, reprinted by Cottager Press in 2011. The Duty of Delight: The Diaries of Dorothy Day, Day’s extensive diaries and journals, edited by Robert Ellsberg and published in 2009 by Marquette University Press, and available in paperback from Image Books. All the Way to Heaven: The Selected Letters of Dorothy Day, Day’s voluminous correspondence to a wide circle of family and friends, co-workers and fellow travelers, edited by Robert Ellsberg and published in 2010 by Marquette University Press with a paperback from Image Books. Comrades Stumbling Along : The Friendship of Catherine de Hueck Doherty and Dorothy Day as Revealed Through Their Letters , moving correspondence between two pioneering women and the love of the God they shared, edited by Robert Wild and published by Alba House in 2009. 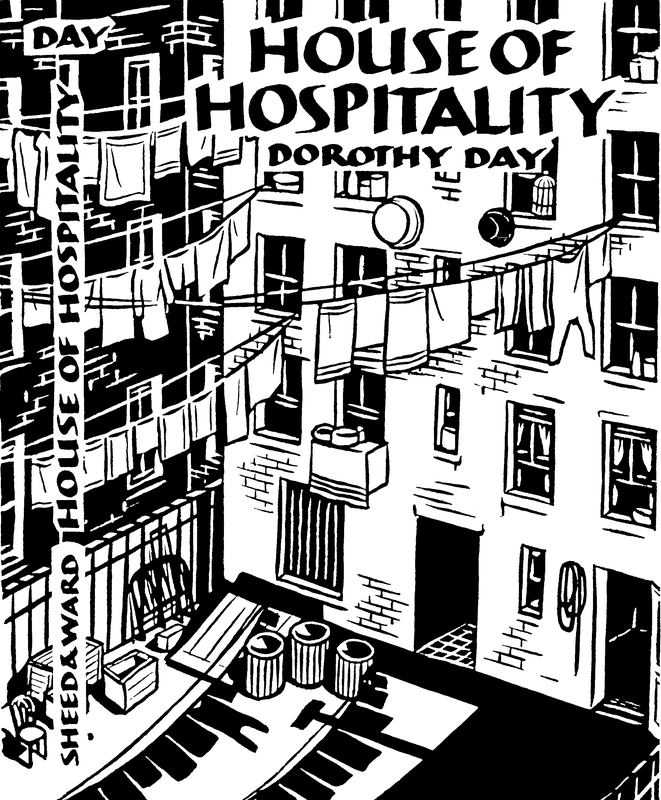 Dorothy Day: Selected Writings, major anthology of Day’s writings, edited by Robert Ellsberg and published by Orbis Books in 1995 (first published by Knopf as By Little and By Little). On Pilgrimage: The Sixties, some of Dorothy’s columns during this historic decade, published by Curtis Books in 1972. Dorothy Day: Writings from Commonweal, collection of Day’s articles and reviews in Commonweal magazine, edited by Patrick Jordan and published by The Liturgical Press in 2002. Therese: A Life of Therese of Lisieux , a biography of one of Day’s favorite saints that illuminates the spiritual implications of her own social activism, published by Fides Publishers of Notre Dame in 1960. All Is Grace : The Spirituality of Dorothy Day, insights based in part on some of her own spiritual writings, quoted and expanded upon by historian and biographer William D. Miller, published by Doubleday in 1987. Loaves and Fishes , Day’s own history of the Catholic Worker movement, published by Harper & Row in 1963 and reissued by Orbis Books in 1997. Available in Spanish: Panes y Peces. Madrid: Editorial Sal Terrae. Peter Maurin: An Apostle to the World , a biography of the co-founder of the Catholic Worker, based on an unfinished manuscript by Dorothy, edited and fleshed-out by scholar Francis J. Sicius, and published for the first time by Orbis Books in 2004. Dorothy Day: A Biography, first major biographical work, by historian William D. Miller and published by Harper & Row in 1982. Dorothy Day: A Radical Devotion, study of Day by Robert Coles, stemming from in-depth conversations with her, and published by Addison-Wesley, Reading, MA, in 1987. All Is Grace: A Biography of Dorothy Day, revised and expanded version, including beautiful photographs, of an earlier biographical work, Love Is the Measure, by Jim Forest and published by Orbis Books in 2011. Dorothy Day: Portraits by Those who Knew Her, memories of family, friends, and colleagues by Rosalie Riegle and published by Orbis Books in 2003. A Penny A Copy: Readings from the Catholic Worker, a sampling of important articles from the newspaper in its first thirty-five years, edited by Tom Cornell and Jim Forest and published by Macmillan in 1968; an updated version, omitting some earlier material but adding newer pieces, was edited by Cornell, Forest, and Robert Ellsberg and published by Orbis Books in 1994. Easy Essays, a collection of Peter Maurin’s famous essays, foundational to the movement, reprinted by Wipf & Stock Publishers. A Harsh and Dreadful Love: Dorothy Day and the Catholic Worker Movement, seminal history by Day biographer, William D. Miller, published by Liveright, New York, in 1973, and reprinted by Marquette University Press in 2003. Wings of the Dawn , delightfully human insider’s view of the early days of the Catholic Worker by Stanley Vishnewski who was there almost from the beginning, published by the Catholic Worker in 1984. A Revolution of the Heart, insightful collection of essays on the movement, edited by Patrick Coy and published by Temple University Press in 1988. Voices from the Catholic Worker, lively oral history of the movement, spanning four generations of Catholic Workers, compiled and edited by Rosalie Riegle and published by Temple University Press in 1993. The Catholic Worker Movement: Intellectual and Spiritual Origins, a fascinating exploration of influences on Peter Maurin and Dorothy Day, including the lives of the saints and the monastic tradition, by Mark and Louise Zwick and published by Paulist Press in 2005. Available in Spanish: El Movimiento del Trabajador Católico: Origenes Intelectuales y Espirituales, published by El Trabajador Católico de Houston. Breaking Bread: The Catholic Worker and the Origins of Catholic Radicalism in America , an engaging study of the Worker’s unique contribution, by Mel Piehl and published by Temple University Press in 1982. Dorothy Day and the Catholic Worker Movement: Centenary Essays , major collection of essays and papers presented at Marquette University to celebrate the 100th anniversary of Dorothy Day’s birth; edited by WilliamThorn, Phillip Runkel and Susan Mountin and published by Marquette University Press in 2001. Dorothy Day and the Catholic Worker, solid study of Day’s career as a journalist, from her first job through the end of her life, by Nancy Roberts and published by State University of New York Press in 1985. American Catholic Pacifism: The Influence of Dorothy Day and the Catholic Worker , only book devoted entirely to the study of pacifism of Day and the Catholic Worker, beginning with a study of her opposition to World War I, edited by Anne Klejment and Nancy Roberts and published by Praeger in 1996. The Life You Save May Be Your Own: An American Pilgrimage, a vivid account of four modern American Catholic authors who made literature out of their search for God — Dorothy Day, Thomas Merton, Flannery O’Connor, and Walter Percy, by Paul Elie and published by Farrar, Straus & Giroux in 2004. All Saints, hailed as a “richly imagined collection of mediating figures in a spiritual communion of many faiths,” written by Robert Ellsberg and published by Crossroad Publishing Company in 1997. The Saints’ Guide to Happiness: Practical Lessons in the Life of the Spirit, a very contemporary and compelling inquiry into why saints matter, by Robert Ellsberg and published by Doubleday in 2003. Between Heaven and Mirth, a seriously light-hearted study of the link between holiness and joyfulness by Jesuit priest James Martin, published by HarperOne and reprinted in 2012. My Life with the Saints, an inviting look into one man’s spiritual journey and his companions on the way, including Dorothy Day, by James Martin, S.J. and published by Loyola Press in 2005. Hidden Holiness, a broad exploration of holiness relating it to “ordinary” life, by Michael Plekon and published by the University of Notre Dame Press in 2009. Saints as They Really Are, a look at sanctity through the journey of contemporary Christian memoirists, including Dorothy Day, by Michael Plekon and published by the University of Notre Dame Press in 2012. Making Saints, a modern classic on sainthood in the Catholic Church and the process of canonization over the centuries, by Kenneth L. Woodward and published by Simon and Schuster in 1990. Marquette University is home to the records of the Catholic Worker movement, beginning in 1962 to gather materials. The collection now comprises more than 200 cubic feet, including the personal papers of Dorothy Day, Peter Maurin, and others involved in the movement; records of past and present Catholic Worker communities; photographs; audio and video recordings of interviews, talks, television programs, and peace demonstrations; and a wide variety of publications. Phillip Runkel is the dedicated archivist who practices his own form of hospitality by welcoming visitors and assisting with every inquiry, small or large. The “official” Catholic Worker website, initiated by Jim Allaire, includes, among other resources, many hundreds of pages of Dorothy Day’s columns and other writings.